The Astonify Show is now playing every Saturday during the month of October at the new Secret Parlor Theatre in Chantilly, VA. Last night was a showcase of sorts, where I showcased part of The Astonify Show and my friend Rick, who owns the Secret Parlor Theatre, showcased part of his show. The results were, well, astonifying! We started the show at 8pm and had a nice audience. The venue only seats 24 and we didn't quite have a full house. Some friends of mine that purchased tickets were no shows. I hope everything is ok with them, because I know they were excited about attending. Astonify, is my interpretation of a 19th Century Parlor Magic Show. I do take some liberties along the way, but they are more for the appeal of 21st Century audiences. Basically, I speed up the presentations slightly. 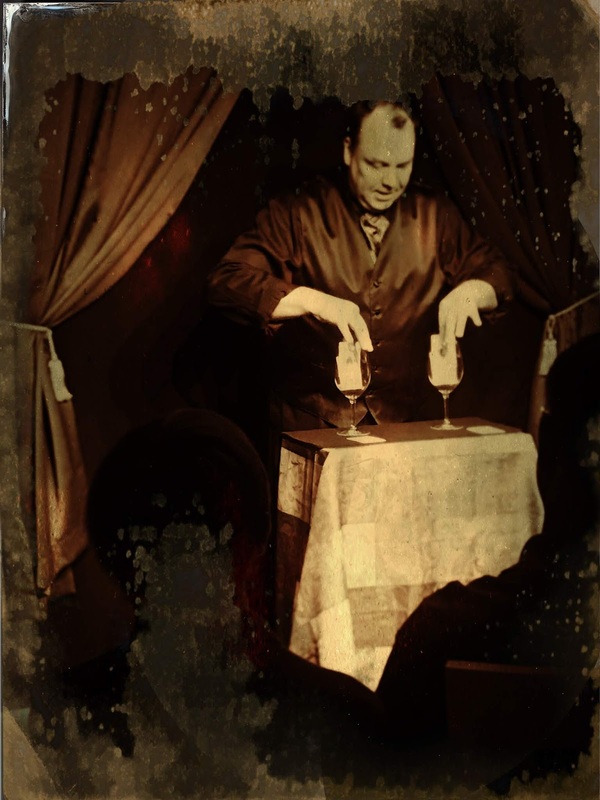 The magic is the type you'd see if you were alive in the 1800s. No modern technology is used in the show, no iPhones, smart phones or that sort of thing. My set ran about 33 minutes. I did half of my magic portion and half of my seance portion. 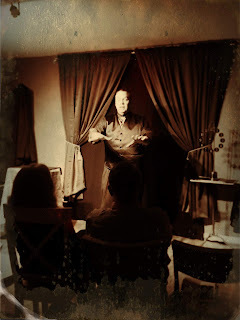 My take on the traditional Victorian Seance is different. But I have an edge over most people.....this theatre actually has a ghost! He has made himself known twice now, once during this show, and once during dress rehearsals the night previous. We heard footsteps coming from the back of the audience, right down the side isle to the front and then stopping. The photo to the left you can kind of make out my Spirit Dial that is a feature of my show. I chose this specific trick because many 19th Century era magicians used it. And wow, does it ever deliver. It's basically a glass clock face with no inner workings. A dial is spun and always lands on the number that people call out. Strangely, it even lands on a number secretly chosen by a spectator, even though, NO ONE knows the number until the dial stops spinning! There is one thing though that I must point out because it is something that I must be firm on in all future shows, this show is NOT FOR CHILDREN, so don't bring them and especially don't bring a baby. Yes, this is exactly what happened Saturday night. A clueless woman brought her 4 year old and infant baby and the baby cried and the kid wandered around. After the show numerous members of the audience complained. They said they really enjoyed the show but the experience was ruined due to the crying baby. I have to agree. No offense to people with kids, there are plenty of activities for kids, and hey, there are magic shows FOR kids, this one is just not one of them. This was designed for adults.